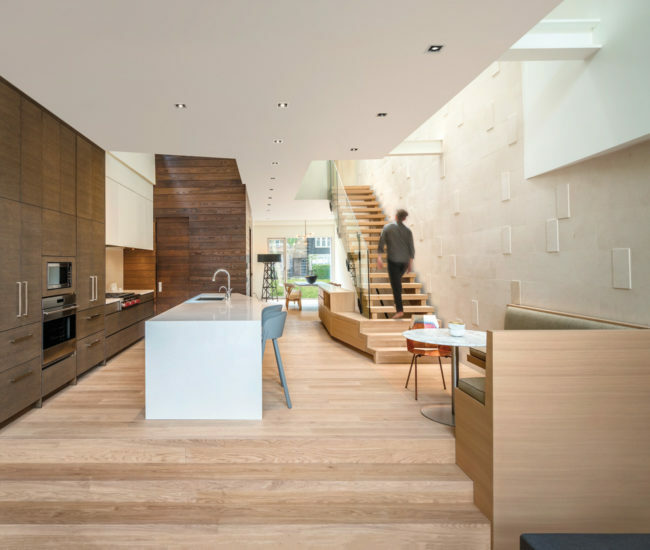 Six skylights illuminate the interior – particularly the stairs – from the top floor to the basement. As well as bringing in natural light, they reduce the risk of falls. The master bedroom and a small balcony occupy the third floor. Knot chair by Thonet. The office overlooks a small backyard and the garage’s green-topped roof. Elk wingback chair by Gus Modern. Even though Relmar House is surrounded by residential buildings, the glassed-in rear section offers enough privacy that it doesn’t need curtains. 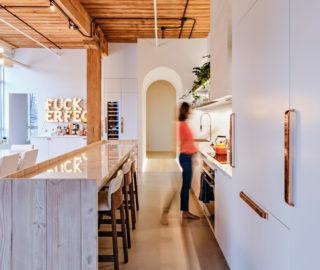 When Jan and Brian Bornstein’s grown children moved out, the couple sold their house and moved into a lower-­maintenance condo. However, they quickly realized that vertical living wasn’t for them, so they bought another house. 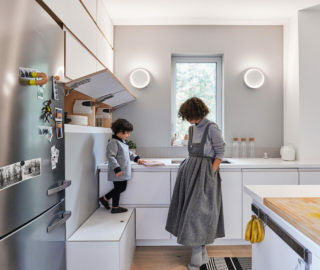 This time, though, they commissioned Toronto architect Luc Bouliane to design a semi-detached that would feel comfortable no matter how old they got. The Bornsteins experienced first-hand what various studies have indicated for years: most people over 55 prefer to live out their remaining years in their own space. 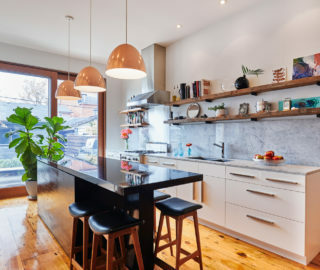 But most houses are not designed to adapt to changing lifestyles, when seniors find stairs harder to climb and they spend far more time indoors. 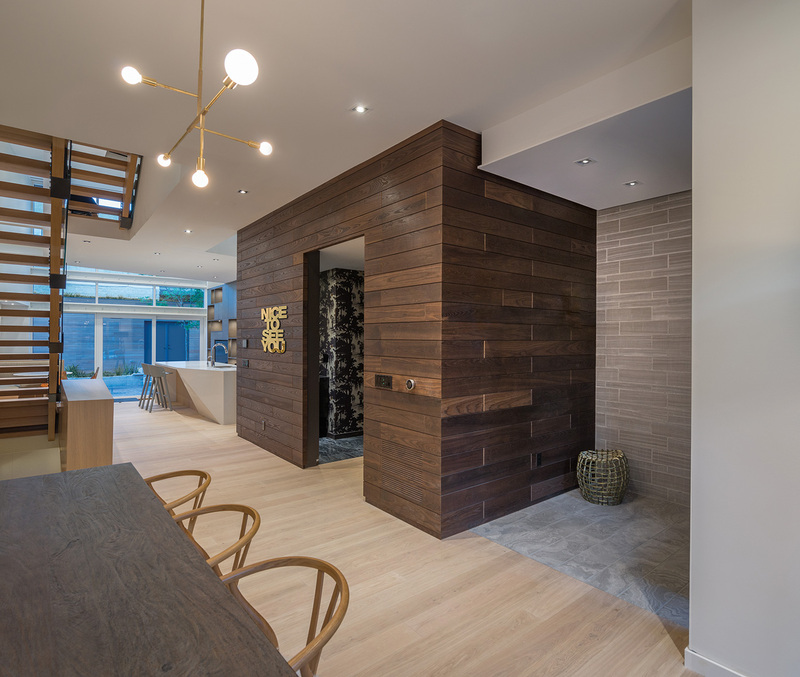 Near the front entrance, planks of North American ash conceal the elevator and a powder room. A Cambridge hydraulic elevator, large enough to hold a wheelchair, connects all four levels. 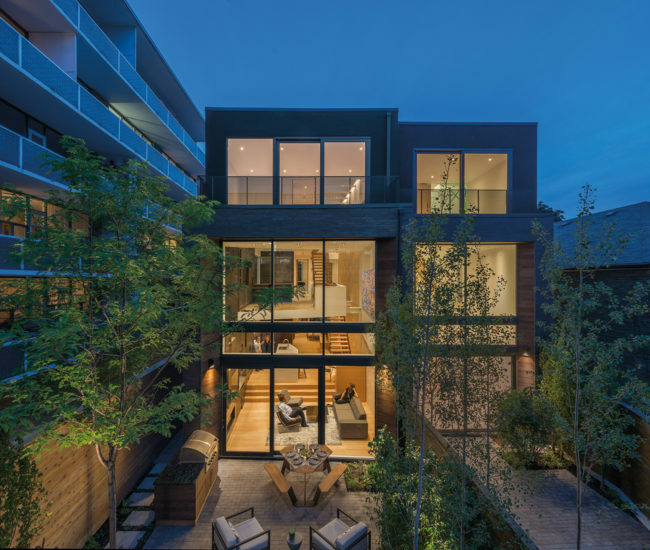 The new house, a modernist outlier on Relmar Road in Toronto’s leafy Forest Hill neighbourhood, anticipates those changes and others. The home is specific­ally built to grow old in. Central to that concept is a Cambridge hydraulic elevator, large enough to contain a wheelchair, that connects the basement to the three upper levels. Among the details added to make the master bathroom hazard-free is a built-in bench in the shower. The shower stall sits flush with the floor to prevent tripping. Extra reinforcement beneath the drywall will allow handrails to be added later. A wide rim around the bathtub makes it easier to get in and out. The bathroom walls have an underlayer of plywood blocking, so handrails can be added without ripping out the plasterboard. One of the biggest issues for seniors is falling, and additions such as handrails can prevent catastrophic slips. 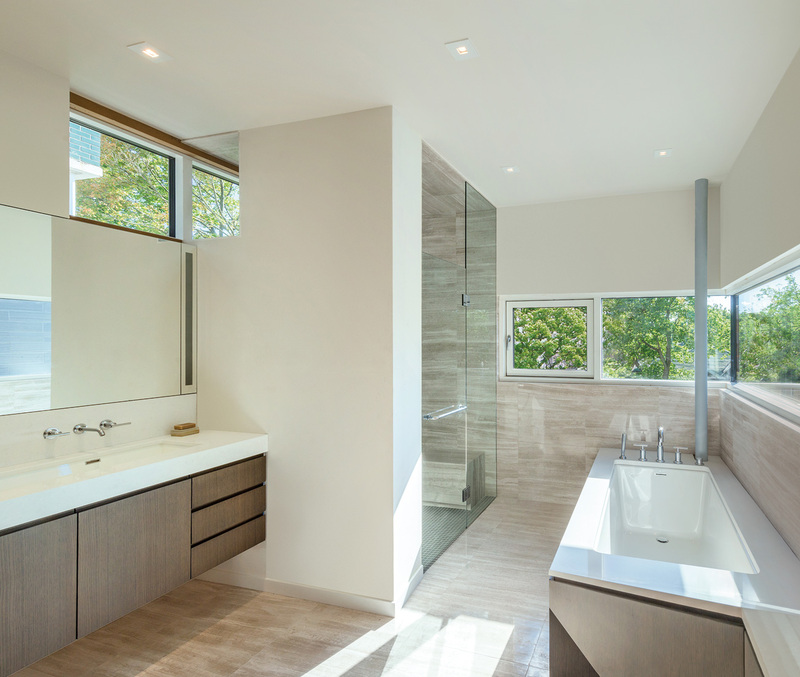 As well, a 20-­centimetre-wide quartz ledge runs along the lip of the bathtub, which allows for ease of entry, and the showers have built-in benches with radiant heat and slip-resistant glass tiling. 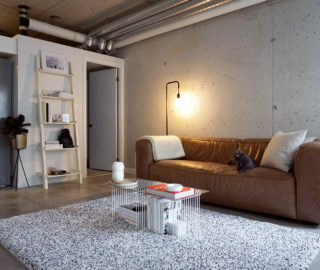 If a live-in caregiver is required, the basement, with its 2.74-metre ceilings and full bathroom, can easily be converted into a single-floor dwelling. It is also equipped with a gym, a spa and a steam room. During the winter months, there is no need to contend with snow or treacherous ice: coils of plastic tubing carry heated glycol beneath the walkways to melt the ice. A gas-­powered Kohler generator on the green roof auto­matic­ally clicks on during power failures, providing enough energy for the owners to live off of the grid for days at a time. Ample built-ins reduce the need to move furniture and other belongings around the house. For Bouliane, however, accessibility is not just a matter of high-tech amenities. It’s also about quality of place. 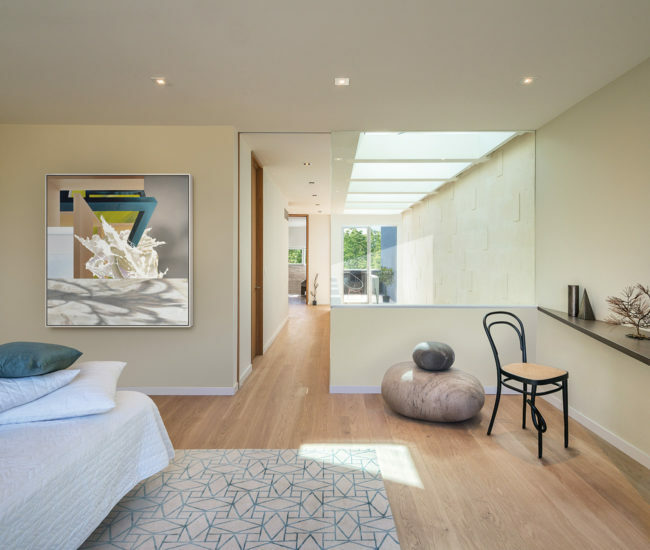 “When you’re post-60 and in the house all day long,” he says, “it’s important that the interior is as bright and friendly as possible.” The house is rectilinear but cranked – a box that has been twisted at the hands of a giant. “We’re con­tem­por­ary in terms of our design, but we don’t take the rigidity of minimalism to heart,” says the architect, who worked closely on the project with Erik Bornstein, the owners’ son and manager of the building firm Mazenga. 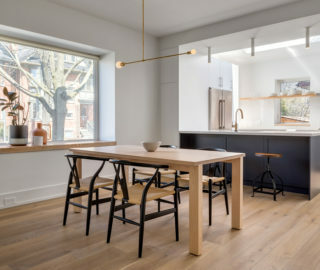 Because the house stands next to an apartment building that blocks the sun, the architect made a geometric slice at one corner of the kitchen island, which maximizes the available light. 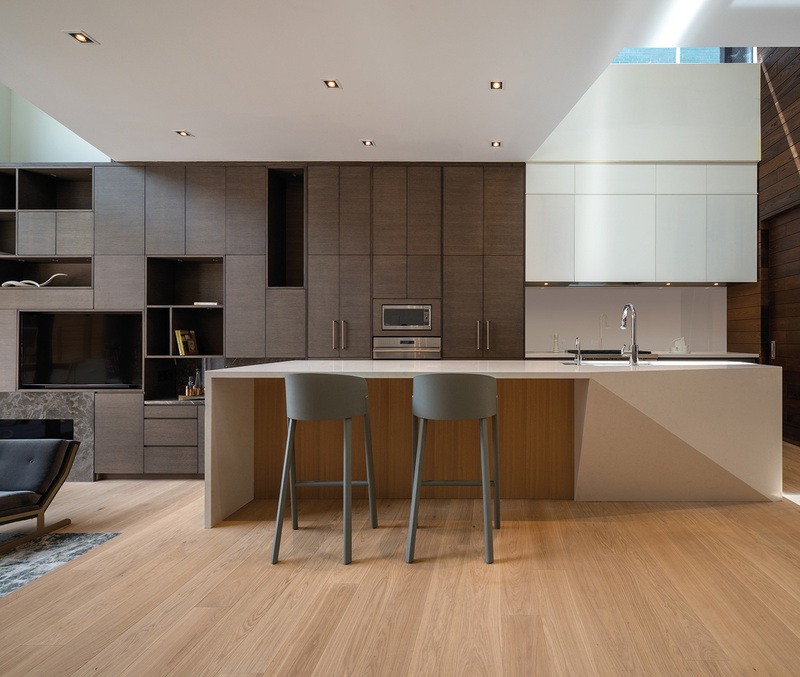 A Caesarstone countertop incorporates space for seating. Bar stools by e15, courtesy of Klaus. 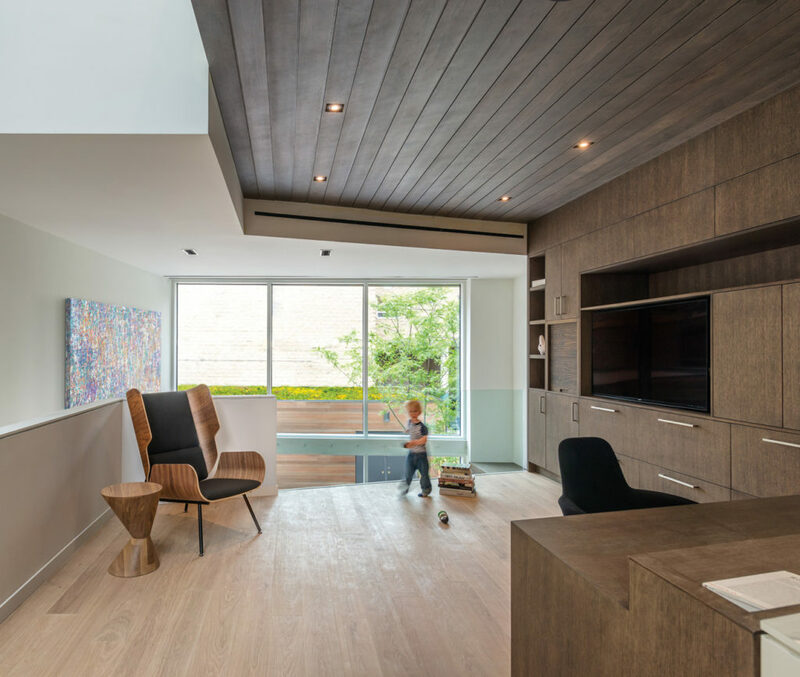 Bouliane’s design flexibility enabled him to optimize space and light. 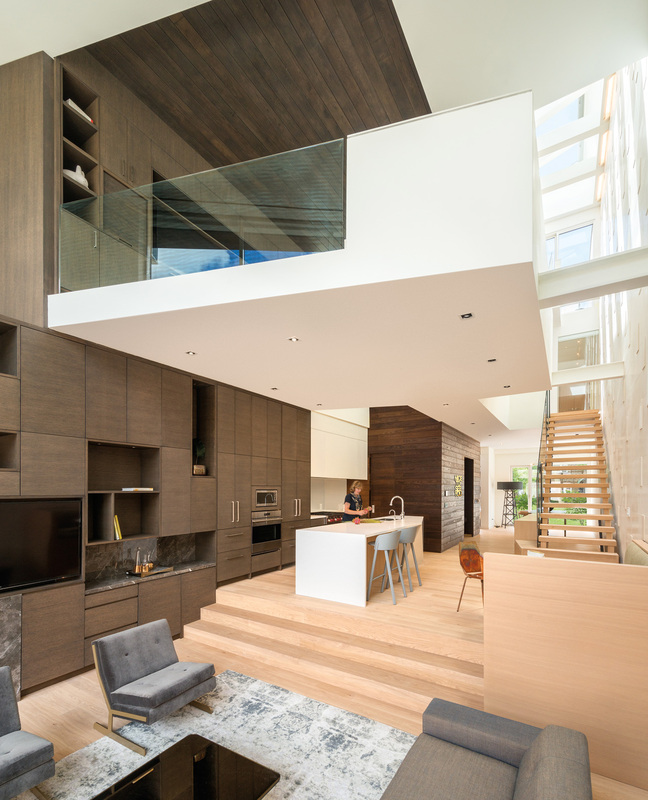 A corner of the kitchen island is cut off to maximize floor space, and the southern wall of the west-facing balcony is set at an imperfect 95-degree angle to catch just a bit more of the late-day sun. Automated blinds can cover the skylights above the stairwell. The glass is angled to allow for snow runoff. 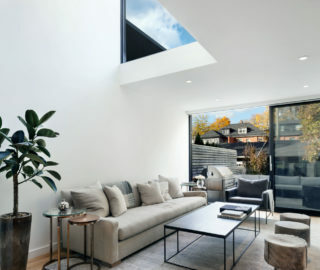 To brighten the interior, the open stairwells, which run along one side of the home, sit beneath an atrium topped with six triple-glazed skylights, each angled at 21 degrees to ensure maximum light penetration. 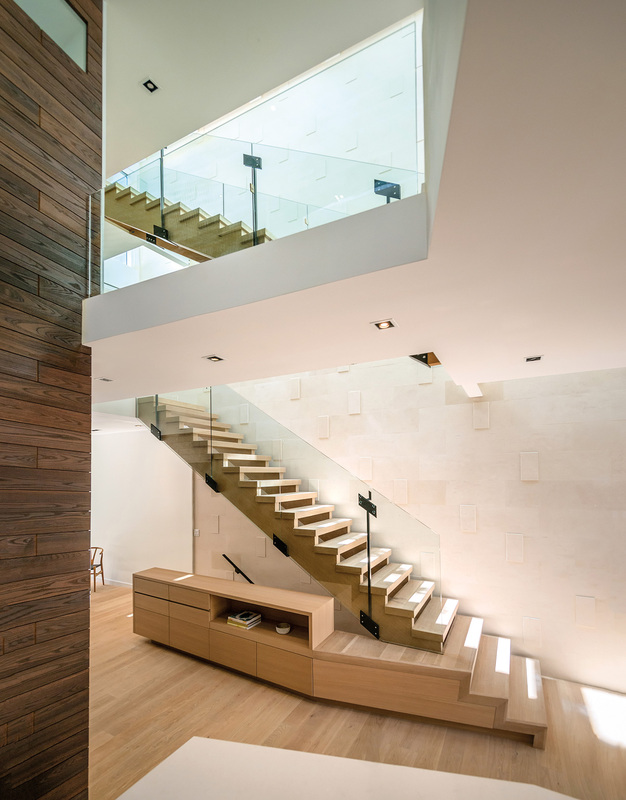 As you move upward, each staircase is offset farther away from the limestone-clad structure, enabling sunlight to bounce off the expansive wall and illuminate all three floors.